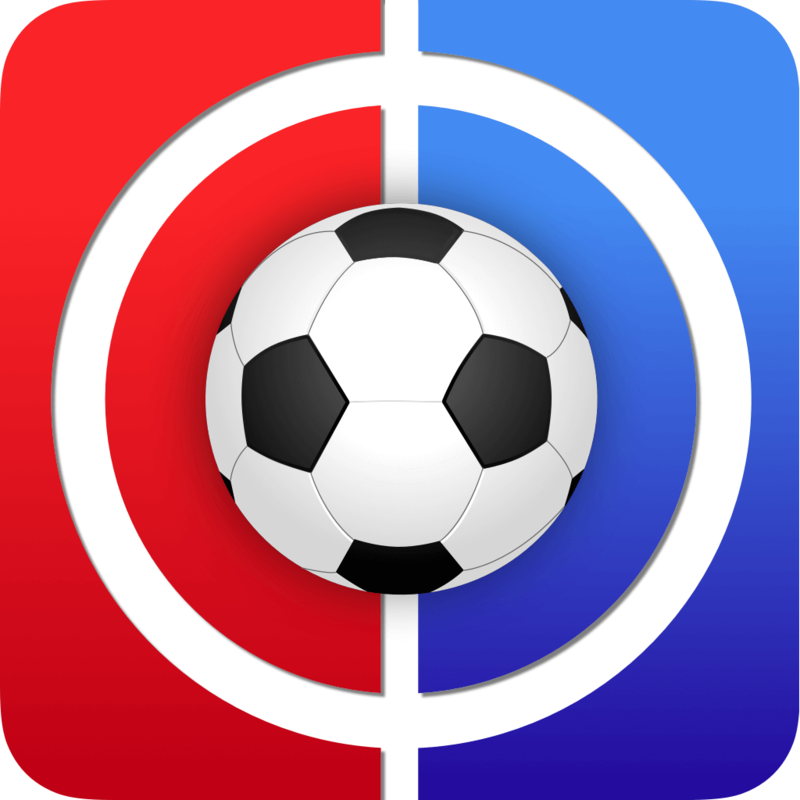 Welcome to Fantasy Football Fixture Analysis Gameweek 26. First of all, if you had him, congratu-flippin’-lations. If you didn’t, I’m sorry for bringing this up. You’ve probably been peppered with group chat messages from that smug arse in your mini-league that only went and triple captained him. You’ve probably been on Twitter and seen cringey attempts at not gloating about triple-digit scores. And now, you’ve probably come here to turn your attention to Gameweek 26 and forget all about Gameweek 25 only to see Rosco bleating about deciding not to captain him. Me too. I haven’t even mentioned his name yet. I don’t really need to because we all know who I’m on about. What’s most annoying is that every man and his dog told Rosco to captain Aguero and yet he still went for Sane. It’s like telling a kid not to do something and then having to listen to them cry at you when they ignore your considered advice and end up falling over. Anyway, it’s been a while since I wrote one of these. Gameweek 15 to be precise. Since then, Huddersfield have managed to pick up one measly point in the league and were smashed 5-0 on Saturday by a side supposedly lacking motivation and not good enough for Sarri. Huddersfield have finally signed another striker. I say ‘another’, but that implies that they had strikers at the club before Karlan Grant’s arrival. Mounie has one goal in 21 appearances this season, which is one more than any of the other strikers! That’s enough ‘kicking a man whilst he’s down’ for this article. 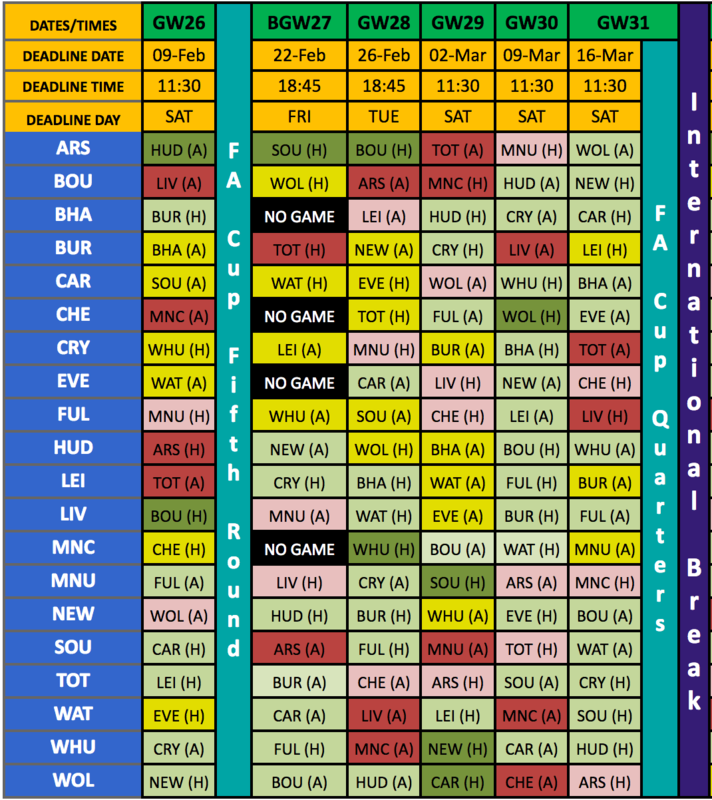 Whilst thinking about which teams to include in this week’s instalment, the blank in Gameweek 27 for Manchester City, Chelsea, Brighton and Everton proved to be a bit of a sticking point. Everyone’s position will be slightly different; some of you will have no players from these teams, some will have a couple, and others will have a handful. As such, it makes it quite difficult to produce an article advising you on which teams to look at. A case in point is Manchester City. The games that straddle their blank in Gameweek 27 are both home games, against Chelsea and West Ham. Manchester City have scored 43 in 13 at home, scoring 2+ in every single one of them. Chelsea conceded four against Bournemouth and two against Arsenal the time before that, failing to score against either side. West Ham have lost their last three away games without scoring. If you are able to bench your Manchester City assets and field a strong (okay, maybe half decent) XI in Gameweek 27, then Manchester City do have favourable fixtures over the next three. If you can’t, then they don’t. Oh dear, I’ve started writing stats in the intro now. As if my articles are not already long enough. It is something to consider when looking at which players to get rid of over the next two weeks in anticipation for the blank though. In short, Manchester City’s players would be the only ones I would be actively trying to find a way to keep. As for Chelsea and brace-scoring Hazard, you will have to read the rest of the article (or just scroll, if you’re already bored). What can I say, I was struggling to find ‘enough’ teams with unfavourable fixtures. At least I’ve given you the take-home point already! Okay, I’m rambling. Let’s look at some fixtures. First up for Emery’s men is a trip ‘up north’ to the John Smith’s. As is clear from my opening remarks, Huddersfield are in dire straits at the moment. One point since beating Wolves in Gameweek 13. Yikes. Huddersfield have scored five goals in 13 home matches, and eight of those games were against teams in the bottom nine. Arsenal have only scored three goals in their last four away games, which is in stark contrast to their other eight away games where they managed to score 2+ in each of them. If Chelsea showed us anything this weekend though, it is that Huddersfield’s opponent’s form pales into insignificance when compared to Huddersfield’s. Arsenal then have home games against Southampton and Bournemouth. The Gunners have scored 11 in their last four home matches and seem to have found their rhythm again. Since Hasenhüttl was appointed at Southampton, the Saints have actually been pretty impressive on the road with two wins, two draws and a loss (and the loss came just three days after his appointment). Despite this, they still failed to keep a clean sheet in four of those fixtures, only managing to shut Chelsea out. It is worth mentioning that Southampton did only concede one in each of those four matches, but why let the most accurate representation of the statistics get in the way of the point I am trying to make? Bournemouth have lost their last seven away games, conceding 2+ in every single one of them and only scoring three. Okay so that does include City, Spurs and ‘new’ United, but it also includes Newcastle (sorry, Rosco), Everton (sorry, Init), and Cardiff (sorry?). Sounds like an easy Arsenal win to me. As someone who got rid of Jimenez for close to his initial price, seeing him soar to £6.7m has been a bitter pill to swallow. I will likely be bringing him back in this week, sheepishly. Gameweek 26 sees Wolves face Newcastle at home. Wolves have scored seven in their last two home matches and won four of the last six (with Liverpool being one of their losses). Newcastle, on the other hand, have won just two games away from home all season, the first against low-lying Burnley and the second against lowest-lying Huddersfield. Bar the game against Liverpool though, where the Reds rolled out 4-0 winners, Newcastle are rarely battered. In fact, that defeat is the only time they have lost by more than a one goal margin away from home, and that includes City, Chelsea and Spurs (and ‘old’ United, but that’s not impressive!). Next up are two away games. The first of these is not walkover of a fixture. Bournemouth have only lost at home to United, Arsenal and Liverpool. Their last four home matches have seen them amass ten points in which they scored 11 goals and kept three clean sheets. Wolves will likely have more joy against their next opponent though; Huddersfield have lost their last six home games, including ties against Brighton, Newcastle, Southampton and Burnley. In Wolves’ last three away matches, they scored three against both Spurs and Everton. They drew a blank against Manchester City, but I guess that’s forgivable. Liverpool’s fans say they haven’t won the league yet whilst others are trying to jinx it by saying they have. Whatever your view, they are top of the league and the 1-1 draw with Leicester hardly spells crisis. Scratch that. Rip up the script. Liverpool have just drawn again and even needed the help of a linesman this time round. Perhaps Klopp laid down some extra-long turf on the touchline to impair the linesman’s ability to keep up with play. Liverpool are still undefeated at home though and in the four home ties before Leicester they scored 16, including three against United and five against Arsenal. As you certainly all know already, Liverpool are short of defenders at the moment. Klopp even had to resort to playing Henderson at right-back last week. Their recent results are evidence of these defensive difficulties; one clean sheet (against Newcastle) in their last five at home contrasts sharply with the one goal conceded in the previous seven matches. At least from an attacking point of view though, the two upcoming home games are a great opportunity for Liverpool to make a real statement of intent to Manchester City. Next week’s opponent, Bournemouth, have been bloody awful away from home since November (discussed above). I dread to think how many managers will deploy Salah as their captain next week. If you don’t have Salah in your team for this one, I’d be frantically searching for a good luck charms shop to purchase a handful of items from. Heck, I’d even consider purchasing the business. Gameweek 27 sees Watford visit Anfield, who are averaging just under two goals conceded per game away from home. Sandwiched between those fixtures is a trip to Manchester United. I’m not going to bend facts by referring to the stats of Mourinho’s United – United are a totally different outfit now under Ole. The same set of players but imbued with belief and freedom. It’s amazing what not blaming and slagging off your players can do. Promisingly for your Liverpool assets, United’s defence has not really improved, conceding in all four home games under Ole, with three of those opponents populating the bottom half of the table. Further, given that Liverpool don’t have a blank gameweek all season, their players should prove to be shrewd investments over the coming weeks as we continue to prepare for (blank) Gameweeks 27 and 31. Manchester United’s fixtures are worthy of a mention, but I figured that it was pointless to go into them in detail because Pogba and Rashford have become as close to must-haves as earplugs when you’re meeting up with a Liverpool fan. Bournemouth’s form, both home and away, has already been considered above. In short, they have been pretty good at home all season but don’t travel well. As such, merely having two away games in the next three could have been enough on its own to merit their inclusion here. To make matters worse, those away games are against two of the best teams in the league in front of their home fans. Arsenal haven’t lost at home since the defeat to Manchester City in the first game of the season and Liverpool haven’t lost at home since April 2017 (against Crystal Palace)! I wouldn’t be surprised to see Bournemouth come out of this period with nine back-to-back defeats away from home. Given this, does it really matter who their Gameweek 26 opponents are? Not really, but it is Wolves, who haven’t kept a clean sheet away from home since the beginning of October. However, in six of those eight games they only conceded one (conceding three against City and two against Cardiff), so it’s hardly a fixture worth keeping your Bournemouth assets for. Furthermore, the longer you keep your Bournemouth players for, the more of your life you waste hating Eddie Howe for how unhelpfully uninformative his press conferences are. Of course, Chelsea don’t have the best fixtures – they only have two of them! 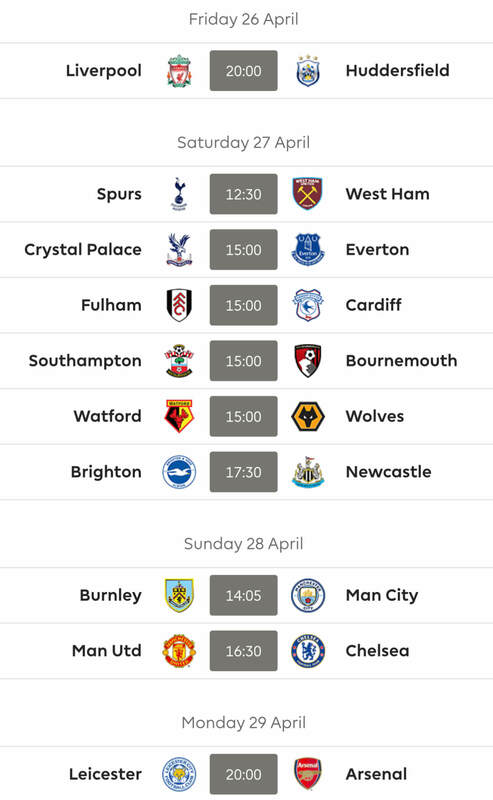 I wasn’t going to put them in this article for that reason, but then I thought that if you currently have ‘too many’ blank gameweekers in Gameweek 27, it might be helpful to point out Chelsea’s fixtures either side of the blank; an away trip to Manchester City followed by a visit from Spurs. We are all well aware of how good City are at home, and Spurs seem to have grown accustomed to not playing at ‘home home’ (a phrase that makes no sense but you all know exactly what I mean, like ‘out out’) now, with eight wins at Wembley. The other four games include narrow losses to Manchester City, Liverpool and ‘new’ United. In fact, the 3-1 defeat to Wolves just before New Year was their biggest defeat all season. It is highly unlikely that Harry Kane or Dele Alli will be back for the fixture, which is at least one positive. In comparison though, Manchester City face Chelsea at home (obviously), and West Ham at home after the blank. I knew I shouldn’t have analysed this in the intro. Now I don’t have much to say. I swear going full circle is supposed to bring a sense of completeness to what you’re writing. Anyway, there it is – City have better fixtures than Chelsea so you should prioritise shipping out Chelsea players over your City boys. Oh, I nearly forgot, Colin told you to f*ck off, Gary Lineker. Wolves through so 31 game vs Arsenal still in jeopardy. It would be very handy for me if they play in 31. Unlikely, I know. Side’s practically there now to take on 31, just need to chip in a couple of others. Leicester, Bournemouth personnel maybe. But deep down I know Wolves won’t be there. Yeah, I suspect they won’t be there. My biggest problem is that I haven’t made up my mind on the chip situation and until the 5th round FA games I don’t think I really can. But could waste a transfer before then….must stay strong. It helps that Liverpool are there. I’d be surprised if Salah isn’t heavily captained that week. Similar thing happened last year. I’m going to try to hold the FH back, not use it in 31. I’m thinking 3 x Liverpool then a smattering of Leicester and Bournemouth – which I think is all we have at the moment in terms of stronger points’ prospects that week. But until the next cup round uncertainty reigns. And I should add – your efforts in gathering together the B and DGW threads is appreciated. Focuses the mind. Manager elcfc is in the same boat as you; he/she has made some clever long-term moves. Feel as if Wolves could play a full strength team though this time – they’re only two wins from wembley! Many thanks for putting Mito’s chip strategy under “Hot Topics”. I’d appreciate it if Mito, or others, could tag their thinking on the coming BGWs as the FA results come in. @Ki, it will certainly come up, but if you have any questions that you want addressed feel free to ask. Think that I will add my thinking on the hot topic thread as things come up that way it is all in one place. I can add to my original comment and post the date I added said comment as we go along, so just check back. And of course just ask on any current article, I am sure someone will address it. I suspect Rosco will also jump in, but he is currently writing Tips so hasn’t been part of this conversation so far, but he has done a bit of research on the blanks and doubles and is well versed on the ins and outs. I blocked off some time yesterday and later today to finish it and that’s just the intro. Thanks Kop. It’s not thaaaaat long, is it? Don’t listen to Kop, your whole article is like the keepers section of one of his. Leave my articles out of this!! I take it that Jimenez and Anderson is not affordable?